Accidents happen. 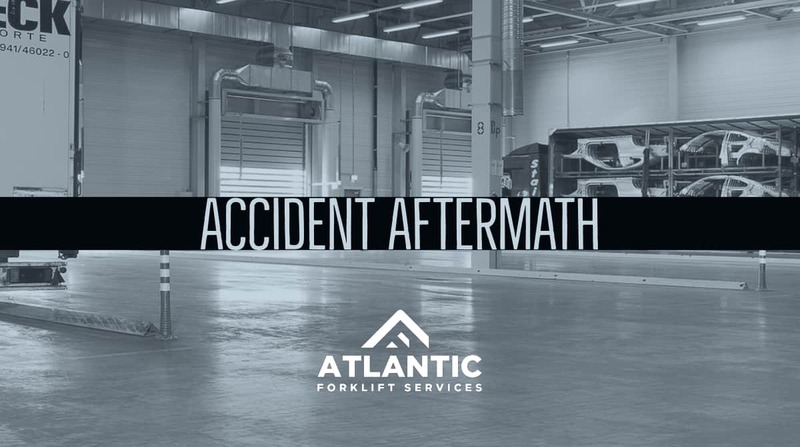 We spend a lot of time in this blog discussing the finer points of forklift operation and safety, and you hopefully offer training and education to keep your people safe, and even still – accidents happen. So we’ve covered what to do before an accident – but what can you expect after an accident happens in your facility? Some accidents can be easily cleaned up with a mop and a bucket, and hopefully that’s as serious as your experience may get. But in the event of a more severe accident, there are many things you will need to consider. For starters, your employees are people, with feelings, and concerns and needs – both personal and professional – in the aftermath of a serious mishap. Let’s start with team morale. It’s going to take a hit after an accident of any severity. The person who caused the accident may take an incident especially hard. It is very important to support the person and reassure him or her that accidents happen and encourage them to learn from their mistake. This assumes, of course, that the accident wasn’t caused by neglect or irresponsible actions on the part of the operator. Then your disciplinary procedure should kick in and the person responsible should be managed accordingly. To prevent accidents in the future, ongoing safety training and professional development is absolutely necessary. Accountability and responsibility are a huge part of workplace safety. After an accident, other employees will likely be more willing to speak up, or handle a situation themselves, if they see something happening that could be unsafe. Encouraging and rewarding your employees when they speak up fosters an environment of trust and support between management and team members. Accountability is a very effective tool in reducing accidents in the workplace. Finally, as mentioned before, continuing education and safety training before accidents occur can literally save lives. Have plans and procedures in place, so that if an accident happens, your people know what to do. Make sure they know where fire alarms, extinguishers and telephones are located. Believe it or not, a small accident where no one gets hurt can be turned into a positive reminder for everyone to be more accountable, and make sure they know the procedures.